The Resource Conservation District provides forums for understanding and learning about conservation of natural resources for landowners, land managers, K-12 and college students, and the general public. These forums include workshops, educational presentations, tours, mailings, media outreach, special events, classroom visits, and internship and volunteer opportunities. Landowners, Land Managers, Ranchers and Farmers: The RCD works with our partners to sponsor on-farm and on-site demonstrations, trainings, tours and workshops for landowners and farmers on a range of conservation practices addressing erosion control, habitat enhancement, water quality protection, and streambank protection. College Students and Volunteers: In partnership with local colleges and universities, the RCD sponsors internship (paid and unpaid) and volunteer opportunities to students interested in watershed protection and resource conservation. Families and Children: The RCD takes an active role to educate Santa Cruz County youth and their families about agriculture, resource conservation and watershed protection. Our staff and interns have helped prepare and present our “Watershed Cruzin': An Activity Guide to Santa Cruz County Watersheds” curriculum to hundreds of fourth through twelfth grade students in the Santa Cruz County schools. 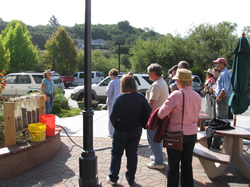 We participate in Santa Cruz Earth Day, the Redwood Mountain Faire, and other community organized educational events. 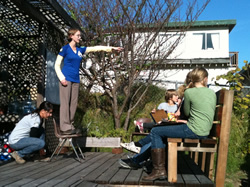 We organize and lead events for children and families, offering first-hand exposure to the natural environment and resources in Santa Cruz County. If you would like to be placed on our mailing list for announcements about future workshops, click here.